Are Faith and Science Compatible? 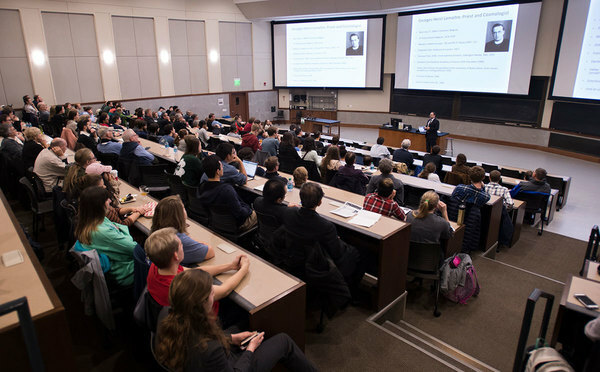 The inaugural Gold Mass and lecture at the University of Notre Dame was held on Nov. 15, 2017, the feast day of Saint Albert the Great, the patron saint of scientists. The events, a campus-wide collaboration among several colleges, centers and institutes, drew hundreds. 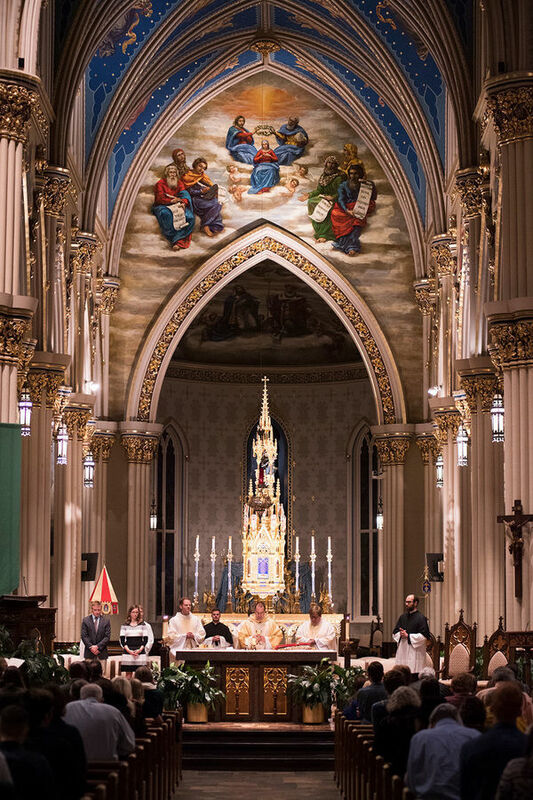 Initiated last year by the Society of Catholic Scientists, the Gold Mass—named because of the hood color worn by those graduating with doctoral degrees in science—is a new tradition to uplift those in engineering and science (much like the Blue Mass, for police officers, or the Red Mass, for those in the legal profession). The first Gold Mass was held at the Massachusetts Institute of Technology on Nov. 15, 2016, Rev. 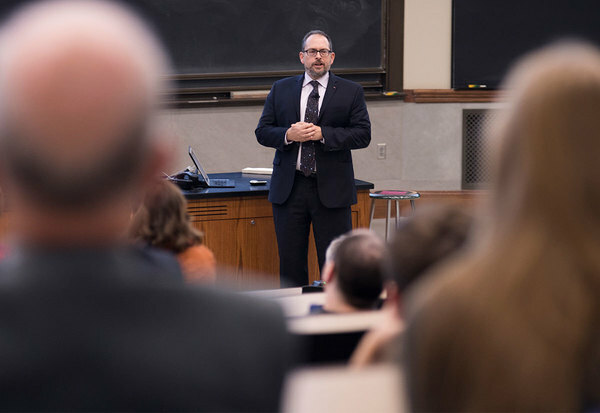 Terrence Ehrman, C.S.C., assistant director for Life Sciences Research and Outreach for the Center for Theology, Science and Human Flourishing, was eager to bring this Mass, accompanied by a lecture, to Notre Dame. The University was one of the seven campuses to hold a Gold Mass in 2017. Peter Kilpatrick, the McCloskey Dean of Engineering, was key in planning and making this year’s event a reality. In addition to the College of Engineering and the Center for Theology, Science and Human Flourishing, the Gold Mass and lecture was also sponsored by the College of Science, the Center for Ethics and Culture, the Institute for Church Life, and the Environmental Change Initiative. 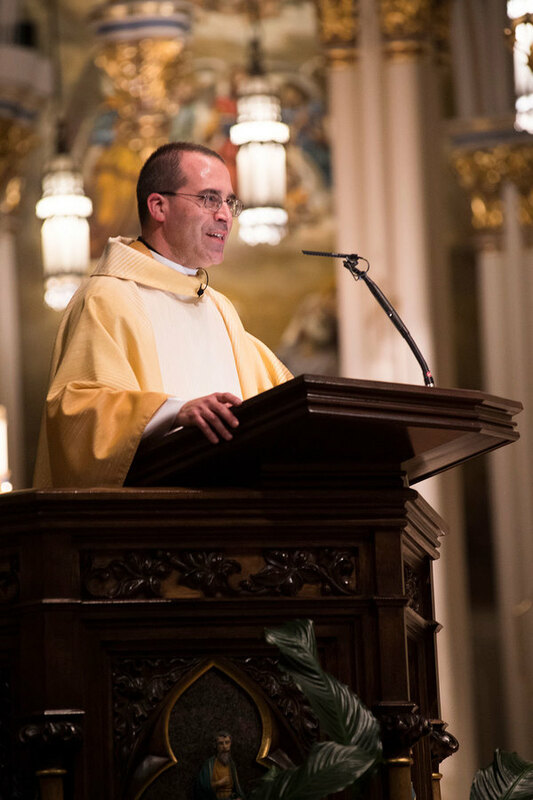 About 300 people attended Mass at the Basilica of the Sacred Heart, and more than 250 attended the Charles Edison Lecture Series-sponsored talk that followed in Jordan Hall of Science, by speaker Jonathan Lunine. Lunine is the David C. Duncan Professor in the Physical Sciences at Cornell University and director of the Cornell Center for Astrophysics and Planetary Science. Debunking this antagonism has become one of Lunine’s passions. The debate has become more acrimonious because of the flood of multiple programming channels, many of which convey the message that science and religion are not compatible. Lunine himself experienced a circuitous path into Catholicism. As a teenager who grew up in a fairly non-religious Jewish family, he had a dream that drew him close to Christ, but he didn’t know quite what to make of it. During his career, Lunine spent three months with the Vatican astronomy group on one of several sabbaticals in Rome. Time spent among many Catholic scientists caused him to begin exploring the faith for himself. After completing the Rite of Christian Initiation of Adults (RCIA), he was baptized and confirmed Catholic in 2007. Nine years later he co-founded the Society of Catholic Scientists with Stephen Barr, a physics and astronomy professor at the University of Delaware. In 2009 he discovered the story of Georges Lemaître, a Belgian priest and cosmologist who originally proposed the theory of the expansion of the universe, which he dubbed “the Primeval Atom” or the “Cosmic Egg exploding at the moment of the creation.” Lemaître had also inferred an important relationship between the distance to galaxies and their speed of recession away from us, which he published in a small Belgian journal that few read. It was therefore overshadowed by Edwin Hubble’s same discovery two years later—published in English in a prominent journal. The principle now bears Hubble’s, rather than Lemaître’s name. Lemaître died at age 71 in 1966 after a long career that included cosmology, mathematics, and computer programming. In addition to sharing how Lemaître balanced faith and science, Lunine admitted having another motive for lecturing about the priest-scientist: He’d like to have the cosmological constant or vacuum dark energy named after Lemaître. The cosmological constant is the “geometric fudge factor” that Einstein included in his equations for his theory of general relativity; the constant prevents the universe from collapsing in on itself. Einstein despised it, Lunine said, “because for him it was the cosmic equivalent of the wires holding up the actor playing Superman.” But Lemaître embraced it in his later papers, describing it as an energy of the vacuum state of the cosmos itself. “It’s a shockingly modern approach to this question, nearly 70 years before scientists described dark energy,” Lunine said. Because there’s no direct path to naming a physical principle after a particular scientist, Lunine is keeping Lemaître’s name at the forefront, with hopes that more astrophysicists will agree. Kilpatrick was pleased with the inaugural events as well as with how many students, faculty and staff attended. Mary K. Galvin, the William K. Warren Foundation Dean of the College of Science, agreed, noting that both events provided an excellent opportunity to highlight the compatibility of science and faith. Originally published by Deanna Csomo McCool at science.nd.edu on December 01, 2017.